Mayor Ravi Bhalla announced a larger downtown hotel with $4 million for local non-profits in exchange for three additional stories and 20% more density. 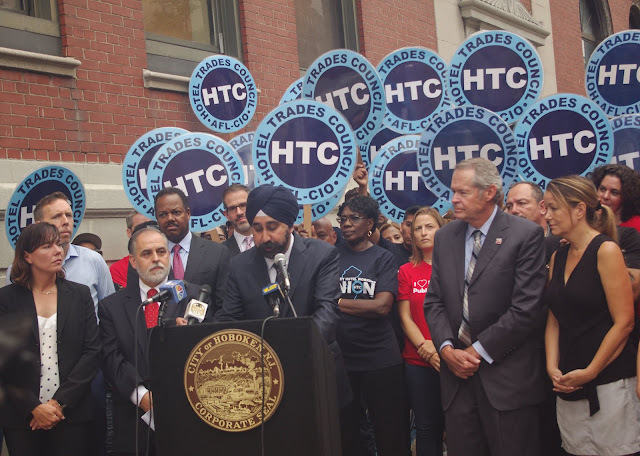 The details were not fully announced as Mayor Bhalla apologized at the end and the full details are forthcoming. Freeholder Anthony Romano (not pictured) attended along with City Council Vice President Jen Giattino, council members Tiffanie Fisher, Emily Jabbour and BoE trustees Sheillah Dallara, Chetali Khanna and BoE President Tom Kleupfel. Oddly, no one spoke from the construction unions as in the previous announcement on the downtown hotel.